Saturn tiles have a textured circular pattern. Available in bold colours, these distinctive tiles work effectively as a kitchen or bathroom wall tile. They are considered to be a contemporary option for kitchens and bathrooms. These premium quality ceramic tiles are hard wearing, durable and easy to clean. Saturn tiles have a shiny finish which emphasises the pattern very effectively. For a close up look at the unique pattern of these tiles you can order a sample. 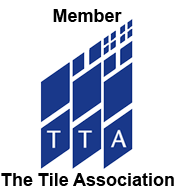 Also, for more information on these tiles you can contact one of our expert advisors. It is often a textural contrast which really catches the eye opposed to just a standard colour or pattern. These tiles are often contrasted with flat, smooth tiles on walls. This combination of tiles is usually separated by a border application. Texture can provide genuine character to interior decors. The pattern of these ceramic tiles consists of different sized circles. Property developers who are looking for a stylish, yet cost effective option for walls will have a high interest in Saturn tiles. These tiles are also easy to install as part of DIY projects and are therefore even more appealing when tiling on a budget.